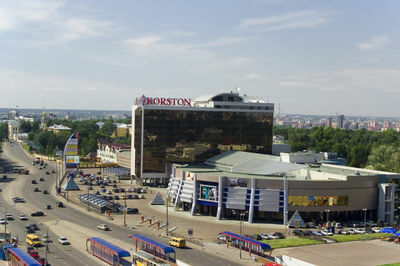 The Candidates matches 2011 will take place at the modern hotel, shopping, and leisure complex Korston in Kazan. The playing area will be the “Balnii” hall, a 1225 square meters uniform open space, with quality light facilities. Lately it has been one of the city’s top places for celebrations, conferences, congresses, and shows. The capacity of the playing hall is about 600 to 700 people. The opening ceremony will be at the “Balnii” hall, starting May 4th at 19:00 local time. Stay tuned for live coverage on Chessdom.com! Honorary FIDE Vice President Mr. Israel Gelfer paid a visit to Khanty-Mansiysk (Russia) during last year’s World Cup on behalf of the WC OC (the commission for World Championship cycle and Olympiad) to follow and advise to the preparations for the 2010 Chess Olympiad. 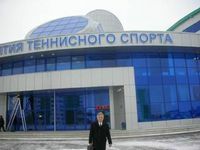 During the visit he inspected the facilities at Khanty Mansiysk. The first stop was the Tennis Sport Development Center, which is the venue of the Olympiad. 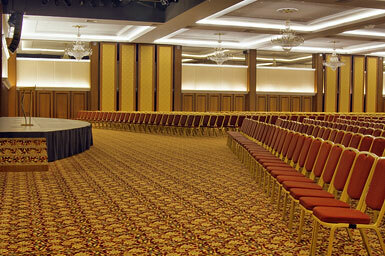 It has a capacity of 3500 spectators, with press conference center, and stable internet. The Tennis Sport Development Center was inaugurated on September 24, 2008. The total area of the Center is 15558 sq.m and has seven courts with special cover. 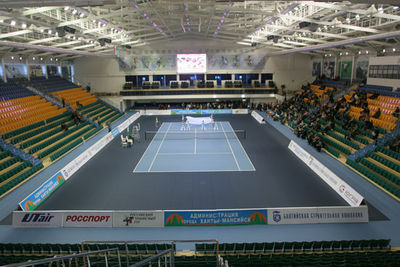 The central court (the playing hall of the Olympiad) has 3500 spectators seats. At the time of the visit, a meeting of the Organizing Committee of the World Chess Olympiad in 2010 and the Congress of the International Chess Federation was held. It was explained that guests will come to Khanty-Mansiysk by charter flights from Dubai, Milan, Moscow, Munich and Prague. Sportsmen of other countries will arrive at Ugra by transit flights via Moscow. About 2000 hotel rooms will be at service of the Olympiad participants – in the hotels “Tarei”, “Yugorskaya dolina”, “Seven hills”, “Misne”. 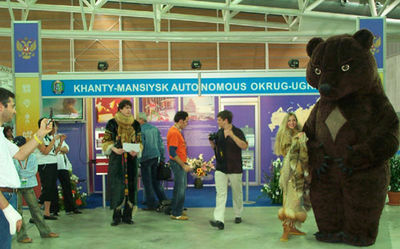 The bear was the mascot of the promotion, will we see it again at the Chess Olympiad 2010? In a press release in February FIDE.com announced that according to regulations official invitation will be sent to federations on April 20th. The prices of the charters with full information about it will be included in the official invitation. Charters are expected to be free of charge for all participants (5 players + captain for each team) who will be only charged for airport taxes (60 USD for each passenger). Final compositions of teams + captains should be sent, also electronically, no later than July 15th and in case not all names were given before May 20th should include all details for visas purposes according to the list which will be included into the official invitation. 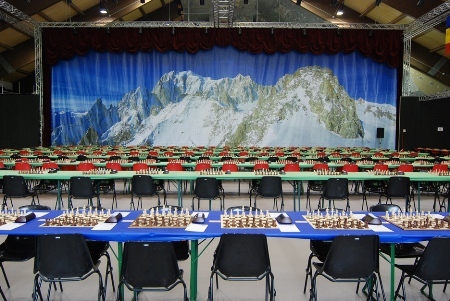 The U16 Italian Youth Chess Championship is currently ongoing in Courmayeur, one of the most beautiful places in Aosta Valley, the Valley of Mont Blanc (with its 4810 meters, the highest mountain in mainland Europe). Nature is a constant presence in the view and the Mount Blanc Valley is a casket full of traditions and folklore. Chess players can enjoy the captivating scenery and the breathtaking panoramas from the play room, the Forum Sport Center. 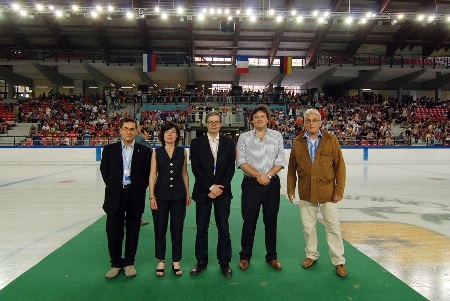 Mr Gianpietro Pagnoncelli, the President of the Italian Chess Federation, also arrived to follow the event. Among the players in the Under 10 group there is Nicholas Mundel, son of Robert, winner of the Nobel Prize for Economy in 1999. He lives in Siena. After the control and another doublecheck, the final number of players reached 860, which is a new record for Italy – 653 boys, 207 girls. There are many families with three sons, but only one with four – the De Filomeno family from Prato, the town near Florence. The newspaper, particularly “La Stampa”, follow the competition with interest and cover it with daily articles. There is also a good coverage from the Rai TV of Aosta, with multiple news throughout the day. The official website www.scacchivda.com has all the pairings, results and daily live broadcast of 10 selected games. Fresh information about the Kamsky – Topalov match has been reported by the Chessdom.com media correspondents for the match. The venue of the event will be the 6th Hall of NDK (The National Palace of Culture), one of the emblematic buildings of Sofia. 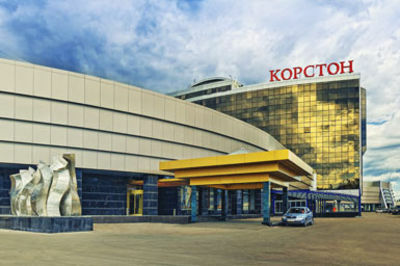 Gata Kamsky and his team of five people will be across the street at the 5 star Hilton hotel, while Topalov with his team will be at the 5 star Kempinski Zografski. Zhivko Ginchev confirmed that the money and the FIDE taxes have been transferred before New Years Eve. At the question who will be watching for “hidden cables”, Ginchev replied, “There will be strict security measures, metal detectors, etc. FIDE has rules and responsible staff for that”. Full audio interview with Ginchev (in Bulgarian) can be heard at this address. Chessdom.com is preparing special coverage for the Kamsky – Topalov match. The Chessdom team for the match will be of 7 people and you will be able to enjoy videos, photos, and multiple interviews from the playing hall. GM Dimitrov will be head of the team of commentators and he will have famous guests in the studio during the match. 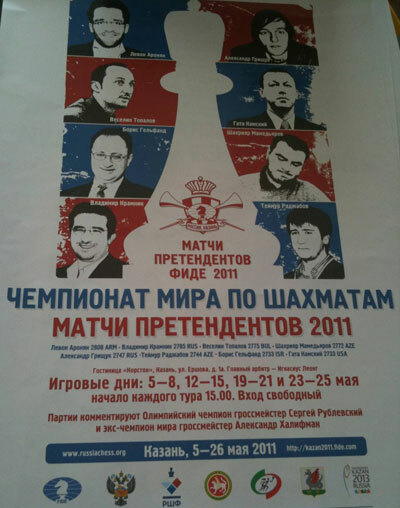 GM Dimitrov has commented most of the major tournaments 2007-2008 including the Anand – Kramnik World Championship match. On the 17th of January GM Dimitrov will also comment the first event of the Chess Grand Slam Corus chess 2009. The match Kamsky – Topalov will be broadcast on the Bulgarian National TV. They have signed a contract for the rights, but it is still unrevealed if there will be key moment direct transmission or the full games will be on air. The National Palace of Culture (NDK is the abbreviation standing for the Bulgarian “Natsionalen dvorets na kulturata”) is one of the symbols of the Bulgarian capital, Sofia. 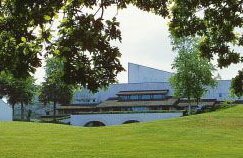 It was opened in 1981 as the largest congress and conference center in Eastern Europe. For the construction of the NDK have been used 10,000 tons of steel, which is more than what was used in the construction of the Eiffel Tower. More interesting construction facts include the movement of 1 700 000 cubic meters of earth and the implementation of 335 000 cubic meters of cement. The construction was led by architect Alexander Barov and continued for 3 years. The total area of the facility is 123,000 square meters, with 8 floors and 3 subterranean levels. Hall 1 is the biggest with an area of 11 000 sq meters and capacity for about 4000 people. 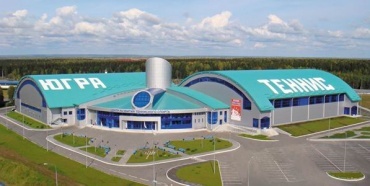 The 6th hall will be the venue of the Topalov – Kamsky match. It is 600 sq meters, 5 meters high, with a capacity for about 500 people. The hall includes TV and audio systems, recording systems, and a simultaneous translation system supporting up to 6 languages. State flags of the participating countries will be placed on the square in front of the central entrance of the Russia’s biggest out-of-door theatre. Many-colored flags will also be hung on the hawsers of the cableway over the lake. Both black and white chess queens will come to the stage of Zeleny theatre on horseback. Organizers keep secret about the way the Prime queen of the event will appear with her retinue. Three masters of ceremonies will greet the audience in the Russian, Kabardian and Balkarian languages. 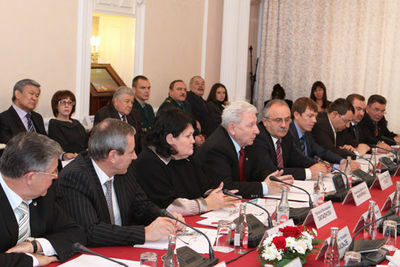 Deputy Prime Minister of the Russian Federation, President of the Russian Chess Federation Alexander Zhukov, President of Kabardino-Balkaria Arsen Kanokov, and plenipotentiary representative of the President of the Russian Federation in the South Federal District Vladimir Ustinov will give salutatory speeches. FIDE President and the President of the Republic of Kalmykia Kirsan Ilyumzhinov will declare the Championship open. All addresses and speeches will be translated into English. The next important act is drawing of lots. Zsuzsanna Veroci, Chief Arbiter of the Championship will declare its results. The program for the concert will include vocal-choreographic composition performed by children’s exemplary music groups of KBR, musical choreographic suite performed by dance groups of “Kabardinka”, “Balkaria”, “Terskie Kazaki”, and songs of KBR pop stars. At the end of the ceremony the audience will see water-pyrotechnic show and fireworks. Kabardino-Balkar Republic was established in January, 1991. Nalchik is the administrative center of the republic. Its territory covers 12470 square kilometers: 100 km from the north to the south and 175 km from the west to the east. According to the Population Census of 2002 the population of the republic is 902 thousand people. Kabardino-Balkaria is a multinational republic, represented by more than 100 ethnic groups. The Republic consists of 10 administrative-territorial districts, 8 cities and towns, two of them are under republican’s jurisdiction, 4 semi urban centers. There are also 113 rural settlement administrations. The republic is situated on the northern flank of the central part of the Caucasus and adjoining Kabardian plain. 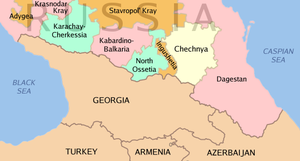 Kabardino-Balkar Republic borders Georgia, Stavropol region, the Republic of North Ossetia-Alania and Karachay-Chercess Republic. The republic is rather peculiar due to natural contrasts, original relief that combines dry steppes and semidesert zones in the north and floriferous plains of foothills, luxuriant alpestrine meadows and mountains, cliffs and unapproachable glaciers covered with everlasting snow in the south. There is a number of unique natural complexes and sights on the territory of Kabardino-Balkaria. Cascaded waterfalls in Chegemskoe gorge, famous Golubye Lakes, dolines and caves of the Malkinskoe gorge, etc. Mountains cover half of the territory of the republic with the highest Mt. 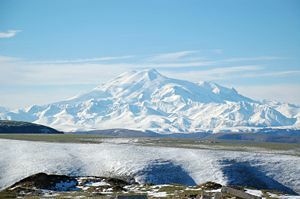 of Europe Elbrus (5642 metres). The capital of Kabardino-Balkaria, the city of Nalchik is in the center of the republic. It is situated at an altitude of 450-600 meters above the sea level, in the foothills of the Caucasus Mountains. According to the majority of scientists the city is named after the Nalchik River, on the shores of which it is located. 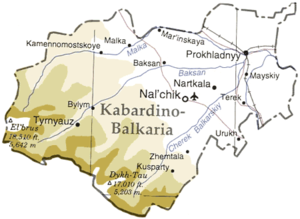 The word “Nalchik” means “small horseshoe” in Kabardian. Nalchik covers an area of 150 square kilometers of which 1000 hectares is occupied by green belt. The population of the city according to the Census data of 2002 is 272 thousand people. It is an all-Russian resort. All agencies of State power are situated in Nalchik as well as an international airport, a railway station, and bus stations of interurban and suburban communication, recreation complex, stadiums, a hippodrome, a State University and other educational institutions. Do you yearn for that unforgettable, carefree vacation to share with your loved ones in the special ambience of a luxurious hotel, situated on the most unique Mediterranean beaches, favoured by glorious sunlight and moonlight, surrounded by evergreen mountains leaving the impression of warm embrace…….. and at the same time enjoy a strong chess event?! It will be more than possible this fall for a big group of chess players that will participate in the European Club Cup 2008. The European Club Cup 2008 (24th European Club Cup for Men, 13th European Club Cup for Women) will be held from Thursday 16th until Friday 24th October. It will be in the G-Hotels complex (Athos Palace and Theofano Imperial Palace) in Kallithea (Greece) , where these days the Halkidiki Chess Open, the European School Individual Championships, and the World Amateur Open are taking place. The hotel is situated at 2 km distance from the lively and thriving town of Kallithea and 5 km from Kassandra, the heart of summer fun, shopping, clubbing and parties of the Western sleeve of the Halkidiki peninsula. 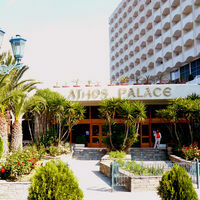 From the moment of arrival you will find yourself surrounded by fabulous vibrant gardens belonging to the hotel grounds. This hotel offers a unique ambiance, Mediterranean spirit, set in exceptional natural beauty, offering infinite gastronomic tastes, all in a luxurious atmosphere with top quality service.. and lots of chess. For years the hotel has been the venue of important chess events, the last of which (currently going on) the Games Festival. The hotel has been recently renovated to offer top comfort – variety of water sports such as banana, water ski, canoes, ringos, scuba diving and pedalos, night clubs, restaurants, swimming pools, tennis courts. Special organized events for the guests, such as Greek barbeque parties and live music beach parties, are held on a daily basis giving our guests the opportunity to experience and explore traditional Greek summer fun and tastes. Theophano Imperial Palace 5* Hotel is a recently constructed natural extention of Athos Palace, where you can escape for a while from the fast track world and allow your dreams to become a reality. It is not easy to describe the comfort and facilities the hotel offers. Incorporating the highest standards, beautifully and elegantly decorated rooms with warm colours, all are appointed with balconies and views over the gardens and the Toroneos Gulf. Probably the best part of the hotel is the first floor. The rooms have private swimming pools, each about 90 sq. meters. Imagine a typical chess player’s day. Wake up, quick breakfast, preparation, chess game… and all day long relaxation in the private swimming pool! Now this is 5 stars chess event, the way every top level event should be organized – with all the comfort for the players and top conditions. The Creta Maris Hotel in Hersonisssos, Heraklion, Crete, is one of the most exquisite chess venues in Europe. It was the venue of World Youth Championships of 2002 and 2004, and it will also host the European Team Chess Championship. The Creta Maris Hotel provides superb accommodation in hotel rooms and suites, all of which are elegantly decorated, fully-equipped and offer comfort and ease during your stay, whether it is for business or for holidays. The Creta Maris Hotel Heraklion is comprised of at total of 547 rooms and suites, which are located either in the main hotel building or in the bungalow complex. Guests can select the accommodation of their choice, with a view of either the sea, the mountainside or the pool area. There are junior, superior and Top VIP suites, family rooms and rooms specially designed for persons with kinetic difficulties. Several suites and rooms can be connected, accommodating larger groups and families. The suites offer a fireplace, bathrobes and slippers, while the Top VIP suites additionally provide exercise equipment, a sauna, a Jacuzzi tub, two or more multi-line phones, a video – CD – DVD player, a fully-stocked bar and a fax machine. with plenty of space for all participants. for free.There are also a bar and a restaurant at very reasonable prices. Since 2005, Grand Hotel Sofia welcomes in it’s luxorious Sofia Hall the M-Tel Masters tournament. 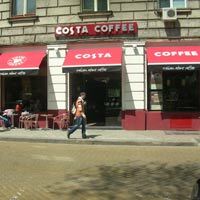 Just 10 km from the airport and 5 km from the train station, it is in the beautiful center of Sofia. Right next to the hotel you can find historical buildings, Ivan Vazov national theter, Sofia Art Gallery, Alexander Nevski Cathedral, St. Sofia Church, St. Nikolay Russian church, as well as the Parliament, The Presidential building, and main administrative and financial institutions of the capital. 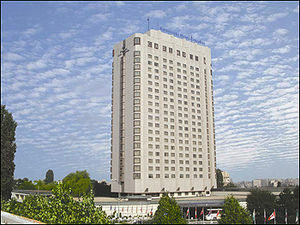 Grand Hotel Sofia is a modern marble-glass building. It has 109 spacious rooms, 13 luxurious apartments, fitness hall (with sauna, solarium, Jacuzzi, special training programs, massage, etc. ), luxurious restaurant, 24-hour room service. The room facilities include modern airconditioner with individual adjustment of the temperature and humidity, direct telephone line, Internet connection, satellite TV, mini bar, private safe, and well equiped bathroom. Grand Hotel Sofia welcomes its guests in the luxurious Restaurant “Shades of Red”. There is also a Viennese Grand Cafe garden, a pleasant place for chill out or meet friends. 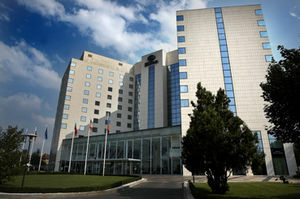 The games of M-Tel Masters tournament take place on the second floor of the hotel in the spacious Sofia Hall. It is 300 square meters and is always full with chess fans during the tournament. There is also a media press room with fast internet connection and modern facilities. 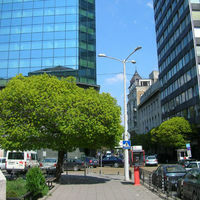 Grand Hotel Sofia was not a random choice for holding such an important Grand Slam event. Besides the great facilities, it carries the spirit of chess. 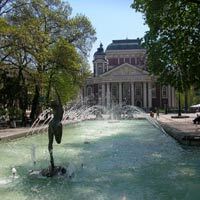 For many years the garden in front of the neighbouring theater “Ivan Vazov” has been full of amateur chess players. Any time of the year you will see there chess boards and a multitude of people around them. Each game is followed by interesting discussions, game analysis, and funny anecdotes.